The Model 16 was also available as an upgrade to the Model II, resulting in an Enhanced Model II. This is equivalent but looked somewhat different as the real Model 16(A) had a white case and front plate and dual slimline floppy drives. This model II card cage looks exactly like that of a Model 16 and also contained a hard disk interface, making it almost full. The first four cards from the right is the Model II set, the fifth is the hard disk interface, also containing some memory (16kByte?). 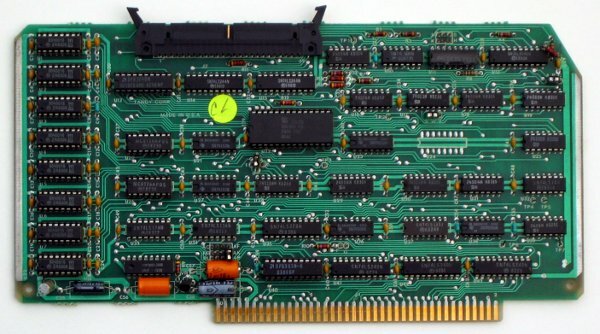 The two cards at the left are the 68000 CPU and memory cards. One slot left. My Model II contained a "Late Design" version of the FDC Interface, having a separate connector and flatcable for the internal drive. 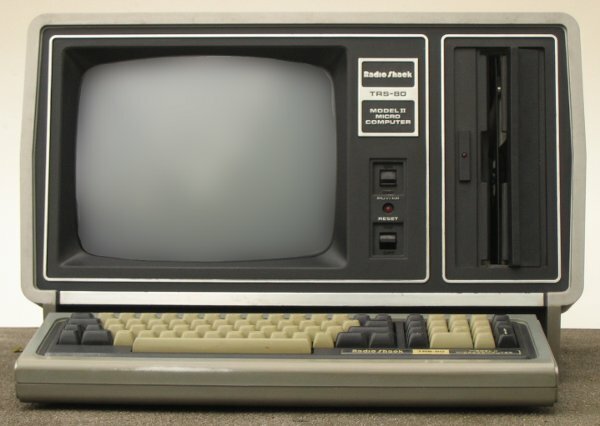 This machine has a REV C "Early Design" FDC with one connector for both internal and external drives. The REV A and REV B have a small "satellite module" between U4 and U16 (Technical Bulletin II-009). The mod between U6-20 (FDC), U32-1, U33-1 and U32-25, U33-25, U10-6 is not described in a Technical Bulletin. This card needs the terminator plug if the machine is operated without the Disk Station. 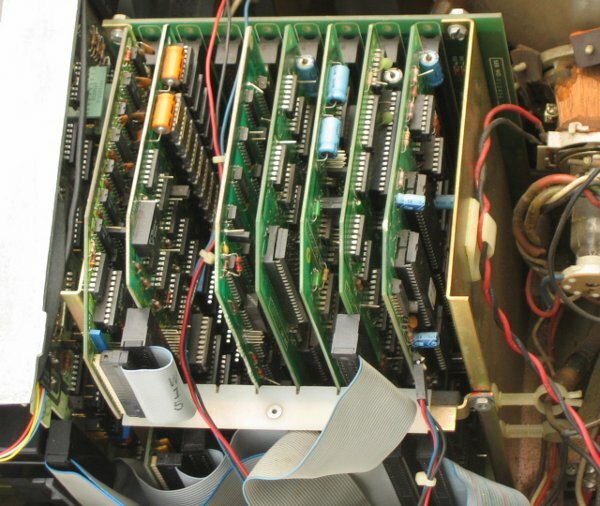 Someone at Vintage Computer Forums kindly provided info on the terminator, which is actually a loopback connecting resistors at the internal floppy drive. 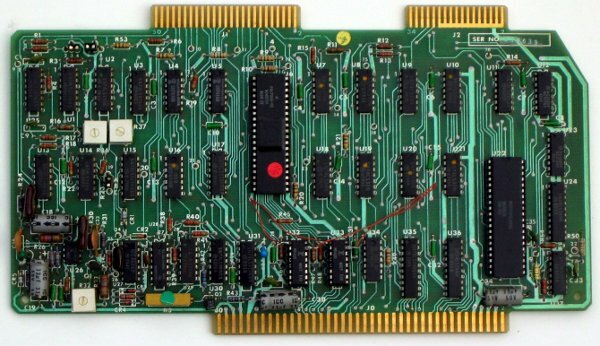 This card interfaces the MII bus to a 50 pin connector, which should be equivalent to the Model 3 and 4 IO-bus. It is used for the external hard disk. There appears to be memory on the board. At the left of the card is the memory bank. 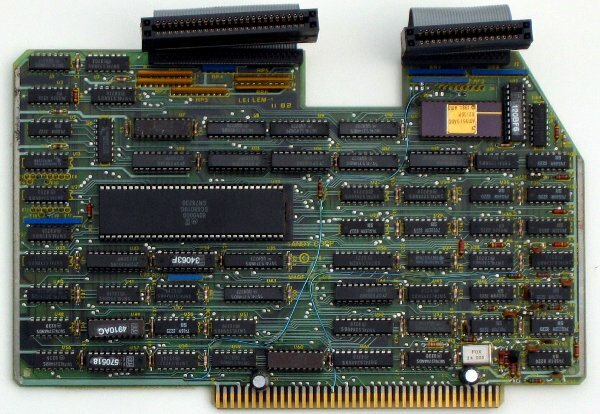 The large chip in the middle is a Z80 CTC. One of its functions it to provide Z80 system interrupts. This means that there cannot be an empty card cage slot between the CPU and the Hard Disk Interface board. The RAM is usually mapped to the lower half of bank F (8000h - BFFFh) as defined for the Model II memory boards. Ths board is a #2 type Hard Disk Adapter, making it unsuitable for usage with the original 8 MEG HARD DISK controller. Fitting an 68000 with supporting chips on a MII size card appeared a bit of an challenge, as it is somewhat larger. Some of the chips are PALs, reducing the chipcount. The cut out between the to connectors is there to adhere to the standard card size for the restrainer. This card has the standard MII card size. 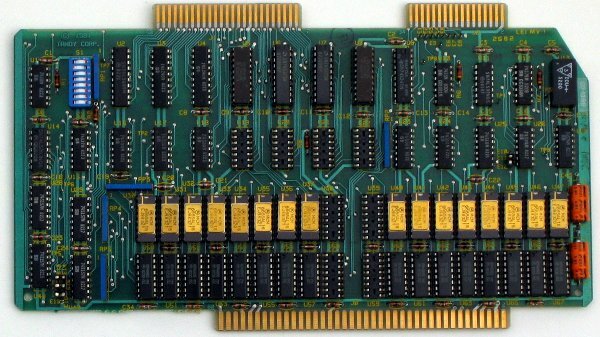 It contains four banks of 64kByte, organized as 128kByte 16 bit wide memory. There are spare sockets, maybe for parity checking.